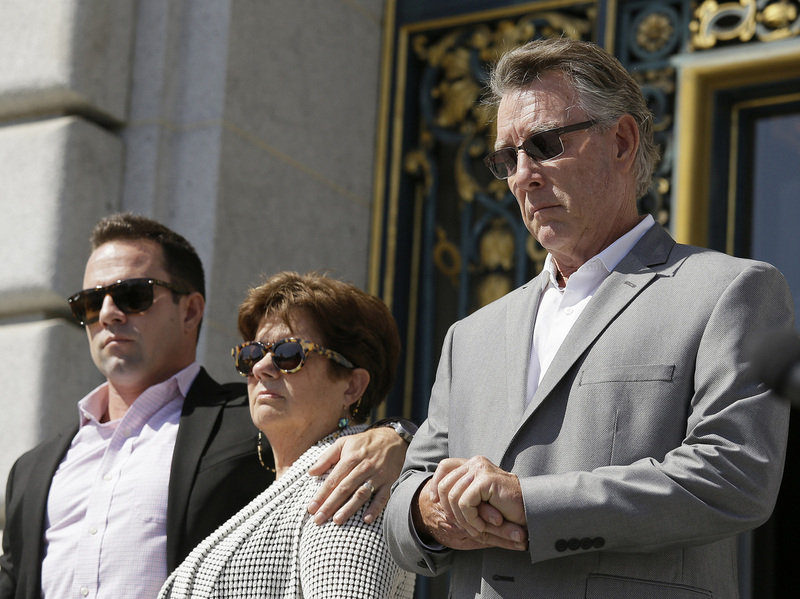 Family Of Kate Steinle Files Wrongful Death Lawsuit : The Two-Way The suit alleges San Francisco's "sanctuary city" immigration policies led to Steinle's death, allegedly at the hands of a man in the U.S. illegally. It also blames two federal agencies. The family of Kate Steinle is suing San Francisco and two federal agencies over her killing last year. In this 2015 photo are Brad Steinle, Liz Sullivan and Jim Steinle, her brother, mother and father. The family of Kate Steinle, the 32-year-old woman who was killed in San Francisco last year allegedly by a man in the U.S. illegally, has filed a federal wrongful death lawsuit against the city and two federal agencies, blaming them for her death. The lawsuit was filed just before the anniversary of Steinle's death. The killing reignited an angry debate over so-called sanctuary city policies, which limit local law enforcement cooperation with federal immigration authorities. The suit alleges that then-San Francisco Sheriff Ross Mirkarimi had eliminated all communications between his staff and agents of U.S. Immigration and Customs Enforcement regarding immigrants in the San Francisco County jail who were in the country illegally. As a result, Juan Francisco Lopez-Sanchez, a Mexican immigrant felon who had been deported five times, was released from jail despite the fact that ICE had issued a request to be notified of Lopez-Sanchez's release. A few days later, Lopez-Sanchez allegedly killed Steinle as she walked along the San Francisco pier with her father. The suit alleges ICE failed to detain or deport Lopez-Sanchez upon his release. It also blames the Bureau of Land Management; the gun that killed Steinle belonged to a BLM agent who had reported it stolen from his car in San Francisco just a few days before the shooting. Steinle's death prompted calls for the revocation of sanctuary city policies across the country, especially from conservative critics and politicians who demanded that such cities risk losing all federal aid. More than 300 jurisdictions restrict cooperation with federal immigration authorities in the belief that residents in the country illegally are more likely to cooperate with local law enforcement if they don't fear being targeted for deportation. The incident also contributed to the end of Mirkarimi's career as sheriff. He ran for re-election last year and lost to Vicki Hennessy, who pledged that she would expand communications with ICE. This week, the county Board of Supervisors unanimously approved a measure to preserve its sanctuary city policies. But it allows the new sheriff to share information with the feds if a detained immigrant is charged with a felony and was convicted of a serious or violent felony in the past seven years.